DO NOT SPRAY WATER ONTO THE GRILL TO CONTROL A FIRE. 1. Make sure the LID IS OPEN BEFORE LIGHTING BURNERS. 2. Make sure all BURNER CONTROL KNOBS ARE IN THE “OFF” POSITION BEFORE opening the valve to the tank inside the cabinet underneath. 3. Slowly turn the valve on the propane tank located underneath inside the cabinet. There is no need to crank this valve all the way open. 4. Push the far right knob down, turn to the left “High” position and hold down until you hear a clicking noise, when the grill ignites, release the button. 5. If the pilot does not ignite, then immediately turn the control knob back to the “OFF” position and repeat Step 4 several times. 6. If the pilot and burner will not ignite within 5 seconds, turn the control knob to the “OFF” position and wait 5 minutes for any excess gas to dissipate. Repeat Steps 4 & 5. 7. If this still fails, sorry, but please submit a work order for the Maintenance Man to check out the grill. 8. If you need additional burners for a larger cooking space, proceed to turn the larger 2nd, 3rd or 4th burner knobs in the same manner. 9. When pre-heating, please close the lid after lighting. Note: There are two additional smaller size knobs on the panel, which are disabled. One is between the Right and Right Center burner and the other one is a smaller black knob on the far left below the Left Burner Knob. The top rack is a warmer rack. For easier clean-up, there is a High-Temperature PAM Non-Stick Cooking Spray for Grilling. Coating your meats with light oil will also reduce sticking. If possible, minimize the use of basting sauces while grilling. See Flare-Ups below. 1. Make sure all BURNER CONTROL KNOBS ARE IN THE “OFF” POSITION. 2. Turn the valve on the propane tank located underneath, inside the cabinet, to the OFF position. Take inventory of the gas gauge and if it is reading low, please put in a work order indicating tank needs to be replaced. 3. Clean grill cooking grids after each use. The grill cleaning brush is located in the cabinet underneath. 5. Do not replace cover while grill is cooling down. The preferred method of cleaning the racks is to keep the grill on for an additional 5 minutes to burn off the leftover food residue. However, this is a problem when you go back to your unit and forget about the grill being left on, which is a hazard and wastes gas. If you are one not to remember to come back, then please turn the grill and the tank off before you leave. Still scrub the grates with the brush in the cabinet underneath. Return when you are done eating; turn the grill back on to burn off the residue. · Wipe off any dripped food/sauces on the outside of the grill with a wet cloth. Do not use any abrasive cleaners on the surface of the grill. · Take the trash to your building’s dumpster and replace the liner inside. Extra bags are in the bottom of the trash receptacle. If you notice they are getting low in quantity, please put in a work order to have an additional role put in the bottom. · Smoking is not allowed in the BBQ area. · Adults and children should be alerted to the hazards of high surface temperatures. Young children and pets should be supervised near the gas grill. · Replace the grill cover ONLY WHEN THE GRILL HAS COOLED DOWN, even if it is the next day. · Do not leave the grill area unattended when operating. · Do not use the grill during the rain or allow the interior to come in contact with any water when hot. · Do not use the hose to put out a grill fire. First of all it's important that you understand that flare-ups are not as big a problem as you might think. Controlled flare-ups are okay; it's when the fire gets out of control that you have a problem. There are several ways to deal with flare-ups and a spray bottle full of water isn't the best way. Planning for Flare-Ups: You need to plan on flare-ups and prepare for them. The first step is to reduce the risk of a flare-up by trimming any and all unnecessary fat from the foods you grill. For the sake of flavor, meats should be left with a little fat on them. This helps prevent meat from drying out while grilling. Now when I talk about fat I mean not only the fat on the meat, but any fat you have added like oils in marinades or sauces. 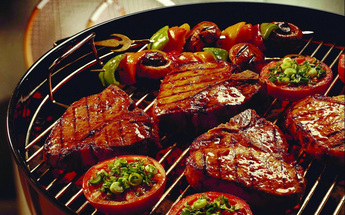 Marinades should be allowed to sink in and then drain off so marinated meat is not dripping in oil when it hits the grill. By reducing the amount of fat on meats that you grill you reduce the amount of flare-ups. Have an Escape: Of course you can't and shouldn't take away all the fat. Foods like chicken with the skin on or a good thick steak or hamburger patties are going to have fat and that fat is going to melt and quite likely catch fire. That's fine. What you need is an escape plan. Unless you are grilling enough food to cover the entire cooking surface of your grill you need to be ready to move meats out of the fire, to another part of the cooking grate. This gives you the ability to keep foods out of the way of a flare-up and prevent burning. Once you have cleared the area of a flare-up of food, let it burn. Fats exposed to flame and intense heat will burn away quickly. You can also use upper warming racks to hold food temporarily while the flare-ups persist. Like fighting any fire the first step is to get the combustible materials out of the fire.